These Bubble Up Pizza Bites are a great addition to school lunch boxes or bento boxes. The recipe is super easy and super delicious, I’ve been instructed to keep these on hand all the time. They’re great to have on hand so I don’t mind, especially if you have kids who don’t like a sandwich in their lunch box or a husband who grabs one for breakfast on the way out the door. A good friend was giving me lots of ideas for other versions such as ham and cheese or feta and spinach, even peanut butter and jelly would be great. Infinite variations on a theme for sure. Oh and talk about kid-friendly to make? My five year old loves to help ‘shove’ the goodies down inside the dough. It must fulfill some primal urge and I’m just glad he’s not taking that out on his brother, heh. 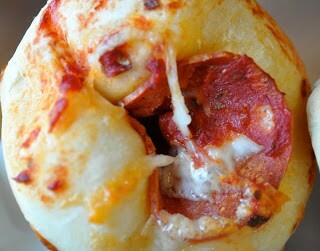 Bubble Up Pizza Bites. Want something your kids will actually ASK for in their school lunches? 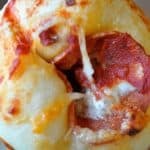 Try these easy tasty Bubble Up Pizza Bites. Take this basic recipe and play with it, make variations that suit you. This is just the tip of the iceberg for this recipe. I hope your kids enjoy these half as much as my family does. If you need more ideas for the lunch box check out my post on that very subject, The Lunch Box Wars. It got ugly for a while but once I figured out how to feed my kids at school everything settled down. It might help you too? Wow, I like how easy and kid friendly they are…and they look so good too. Perfect for my bentos. I would love one right now! The boy asked me if we could make bubble up pizza this week. Looks like we're going to be making bubble up pizza bites! These are totally awesome and J will love them! He's a pizza fanatic! These look like so much fun for kids and adults alike. Love pizza and bubbled-up sounds fabulous! Gotta try these!!! These are also fun for the kids to make. So fun and easy! Perfect for the kiddos 🙂 Pinned! My kids would gobble this up (husband, too haha)!